Step 1 Heat the oven to 350 degrees. Cut the brioche into 1/4-inch cubes and place them in a large bowl. Step 2 Combine the whipping cream and vanilla bean in a small saucepan and bring to a boil. Step 3In another bowl, whisk together 1 1/2 cups of sugar and the egg yolks until well incorporated, about 30 seconds. Pour 1/4 of the hot cream into the egg mixture, mixing immediately. Return all of the egg mixture to the milk and whisk well. Step 4Sprinkle the brioche with 1 teaspoon cinnamon, then moisten the bread with the cream and egg yolk mixture. Step 5Place the apples in a saucepan with the water, the remaining cinnamon and 1/2 cup sugar. Bring the mixture to a boil, reduce the heat to medium-low. Simmer, stirring frequently, until the apples are soft but hold their shape, 15 to 20 minutes. They will caramelize. Be careful not to burn them. You may have to remove the pieces that are done to a separate bowl, leaving those that are still too hard in the syrup to finish cooking. Let them cool slightly. Step 6Fold the apples and the raisins into the brioche. Step 7Divide the mixture among 8 (8-ounce) ramekins, topping them off with any excess liquid. Place the ramekins in a large baking dish. You may need to use 2 to fit all of the containers. Fill the dish with water so that it reaches halfway up the ramekins. Step 8Bake until the puddings are puffed and golden brown, about 30 minutes. In Recipes-list.com we have selected the most viewed recipes from category - Desserts . Enjoy the best recipes specially selected for you! 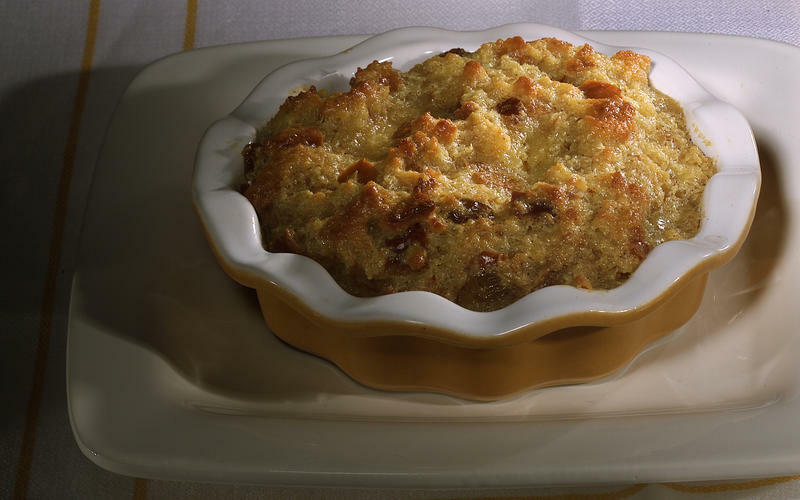 Apple brioche bread pudding is the right choice that will satisfy all your claims.